His Beatitude, Metropolitan Tikhon, will preside at the annual pilgrimage here August 7-9, 2013 marking the 43rd Anniversary of the Glorification of Saint Herman of Alaska, one of the first Orthodox Christian missionaries who began his ministry in North America in 1794. Saint Herman was glorified by the Church on August 9, 1970 and is universally recognized as a saint of the Orthodox Church and the protector of the Church in North America. He is the first Orthodox Christian saint to have been glorified in North America, where Orthodox Christianity will celebrate its 220th Anniversary in 2014. His Eminence, Archbishop Benjamin, and the clergy and faithful of the Diocese of Alaska will host the pilgrims at the opening celebration—the Akathistos Hymn in honor of Saint Herman—at Kodiak’s Holy Resurrection Cathedral on Wednesday evening, August 7. On Thursday morning, August 8, boats will leave Saint Paul Harbor for Spruce Island, where Saint Herman lived and prayed from 1808 until his death in 1837. The hierarchical Divine Liturgy will be celebrated at the island’s Saints Sergius and Herman of Valaam Chapel, built in 1895 on the site of Saint Herman’s original gravesite, followed by a picnic on the beach at Monk’s Lagoon. Upon their return to Kodiak, pilgrims will enjoy a soup dinner at the cathedral before the celebration of the Vigil. On Friday morning, August 9, the Feast of Saint Herman, the hierarchical Divine Liturgy will be celebrated at the cathedral, followed by a grand banquet at the Sun’aq Tribal Hall. A monk of Valaam Monastery, Saint Herman came to Alaska in 1794 to serve the Alutiiq people and Russian fur traders. 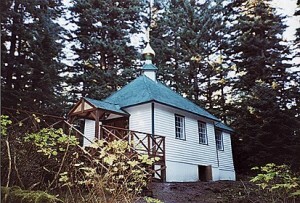 A tireless laborer as a simple unordained monk, Saint Herman established the Orthodox Church in Kodiak, defended the people against arguably outrageous treatment by Russian colonial officials, and cared for orphaned children on Spruce Island. He lived out the last 30 years of his life on the island as a hermit. During this time he pioneered gardening, cared for those in need, and worked many miracles of healing and protection. At his death, a column of light was seen throughout the region rising from the forest to the heavens. Additional information may be found atwww.dioceseofalaska.org/html/2013pilgrimage_schedule.html.